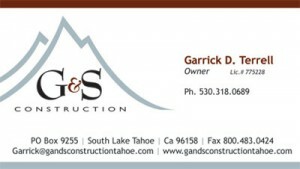 G & S Construction’s Contractor’s License — View our contractor’s license. California State Contractors State License Board — Learn more about a contractor’s license. NV Contractor License Board — View our license for NV. Highmark Designs in South Lake Tahoe — Design and production of this website.